Hundreds of people laced up to participate in the first ever Sarah Beckett Memorial Run in Langford Saturday. Colleague Pamela Scheidl remembered Beckett as "a wonderful person" who was "always great for a laugh." Const. Sarah Beckett, 32, was killed in the line of duty on April 5, 2016, when her marked police cruiser was broadsided by a speeding pickup truck. Beckett, a mother of two boys, had recently returned to work from maternity leave when she was killed by the drunk driver. 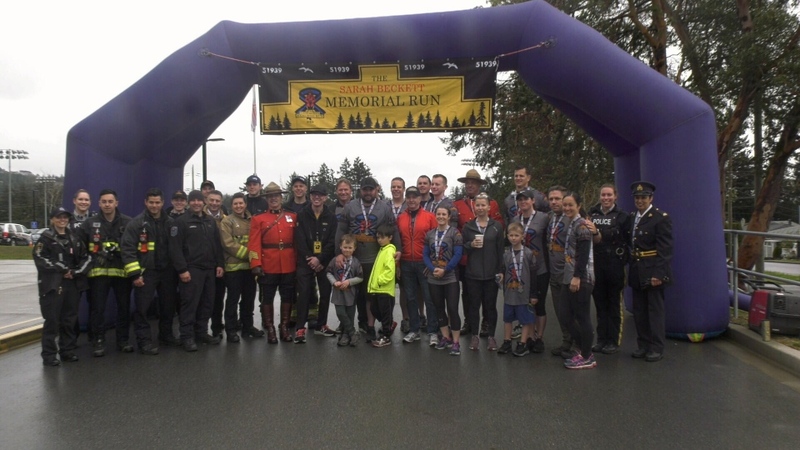 The memorial run is a way for people in the community to honour the officer. "The amount of people that showed up today for this event speaks volumes to how much everyone cares about Brad and Sarah and the family," said Veronica Somers. Her colleagues remember her for the joy she brought to the job. "It's just an excellent day to support Sarah's family and the community in West Shore," said Richard, a retired RCMP officer. It was the first run in Beckett’s memory and organizers are not sure yet whether it will be an annual event. Money raised will go to the Const. Sarah Beckett Memorial Scholarship to help students pursue an education in legal studies. RCMP, first responders and Const. Sarah Beckett's family participated in the Sarah Beckett Memorial Run on Saturday, April 13, 2019.